Email overload is the disease of the 21st Century Office life. How often do you look at your inbox and shudder inwardly at the number of emails screaming, ‘attend to me now’? But do they really all need you’ attention? Do you find yourself checking emails late at night (even on vacation) to reduce the email overload? Taking Control of Your Inbox is dedicated to all those PAs and EAs who spend much of their day managing their own and their boss’s bulging inboxes. reduce the stress arising from email overload. After 30+ years in this profession and I still learnt so much from this book. Brilliantly written! Loved the way the characters, Sophie and Max, shared their ideas and simple solutions to make our lives easier and less stressed whilst dealing with our over-crowded inboxes and at the same time sharing some interesting tips on email etiquette. Taking Control of Your Inbox will enable you to improve performance and rebalance your work-life balance whilst staying in control of your inbox. Taking Control of your Inbox is available now through Amazon (as an e-book or traditional paperback). Brilliant Email will show you how to use email effectively to win back time and dramatically improve your personal productivity and work/life balance. Help your colleagues to use email more effectively. The principles in this book have been developed over the last decade as a result of the author’s work with individuals and organisations of all sizes (from micro to global FTSE top 100). By adopting some of these basic principles of email best practice, you will learn how to take control of your inbox to dramatically improve your productivity, your quality of life and never send an ineffective email ever again. With ‘Brilliant Email’ Monica has created a unique reference book for email users, which combines a ‘Haynes Manual’ and ‘Debrett’s’. This book will appeal to every strata of the business world. 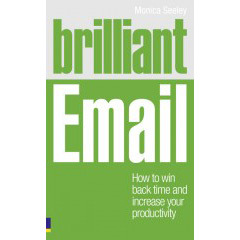 If there’s anything you want to know about email and getting the best out of it Monica knows the answer…This book is a really good reference point for people who want to tame their e-mail addiction and improve their skills. Copies of Brilliant Email can be ordered from Amazon. Monica has carried out in-depth research, over the years, into how IT and especially electronic communications (in particular email) can be used to improve personal efficiency and productivity. ‘Managing in the Email Office’ by Monica Seeley and Gerard Hargreaves, published by Butterworth-Heinemann (ISBN: 0750656980). 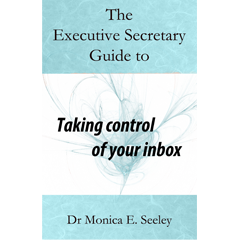 ‘Using the PC to Boost Executive Performance’ by Monica Seeley published by Gower Publishing Limited. (ISBN: 0566081105). Gender and Communication at Work edited by Mary Barrett and Marilyn Davidson and published by Ashgate (ISBN: 0754638405). Copies can be ordered either from Amazon or the publishers.